Full Description: British postcard of ‘Joe Blackburn, the Blind Musician, and Wife’. 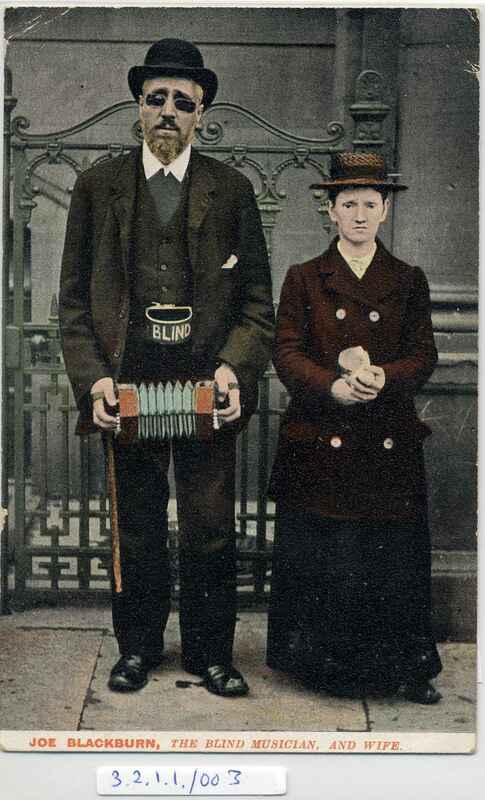 Hand-coloured photo of the couple, he playing an Anglo concertina and wearing a ‘blind’ collecting box. Divided rear, stamped “R & N Series”. See Museum postcard entries for “George Young, Blind Musician” (3.2.1.1-008 to -012), and see Museum Item No: NC.3.1.3.6-013 onwards (http://www.concertinamuseum.com/NC3010306-013.htm) for the archives of E Douglas, blind concertina player of Gateshead.